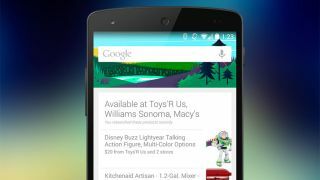 Soon any app will be able to access Google Now. One way of settling the iOS vs Android vs Windows Phone debate would be to have Siri, Google Now and Cortana fight it out in some sort of cage match. That's unlikely to ever happen, but if it did then two of them would have reason to be concerned, as Google's contender is about to get a substantial update. Google Now's Director of Product Management Aparna Chennapragada has said APIs will shortly be available to let any app show cards inside the Google Now interface. Android will decide what to show based on the apps you make the most use of. A select number of third-party apps can already access Google Now, including Airbnb and Lyft, so Google is obviously happy enough with the way this trial run has gone to offer access to all Android developers in the near future. Chennapragada, speaking at the SXSW festival in Texas, added as an aside that support for theme park ride queues was also on the way - so Google Now can tell you when there's no waiting time at Oblivion. The exec went on to say that the Google Now team was working on ways of personalising its data more effectively - some people like to arrive at the airport earlier than others, for example. We should hear lots more at the Google I/O developer conference at the end of May. No doubt Siri and Cortana will be watching closely.